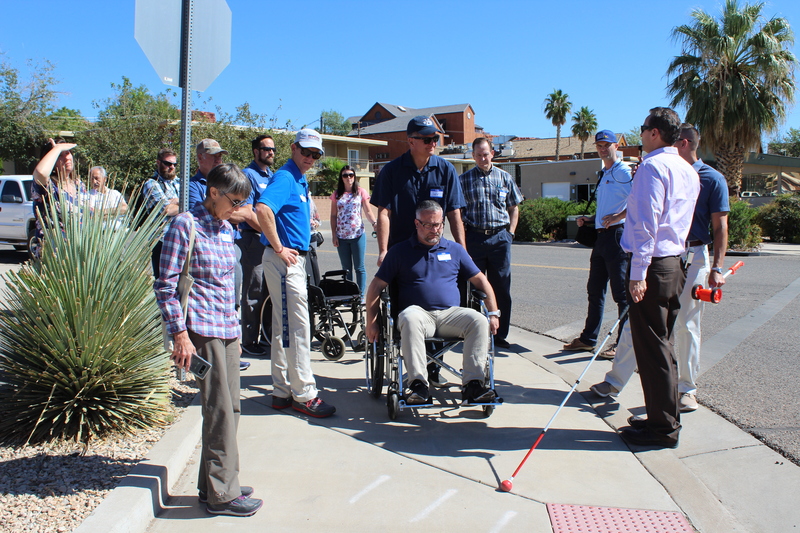 ST. GEORGE — Participants in a walkability training class Thursday had the opportunity to experience what many never will: what it’s like to navigate the streets of St. George from the perspective of someone with a disability. After hearing consultants Chris Danley and Don Kostelec from Vitruvian Planning in Boise, Idaho, speak on pedestrian safety and accessibility when designing roads and sidewalks, a group of planners, engineers, advocates and other community members from around Southern Utah took a walk to see firsthand how walkable their streets are. The walk began at the St. George Opera House at the roundabout on 200 North and Main Street. 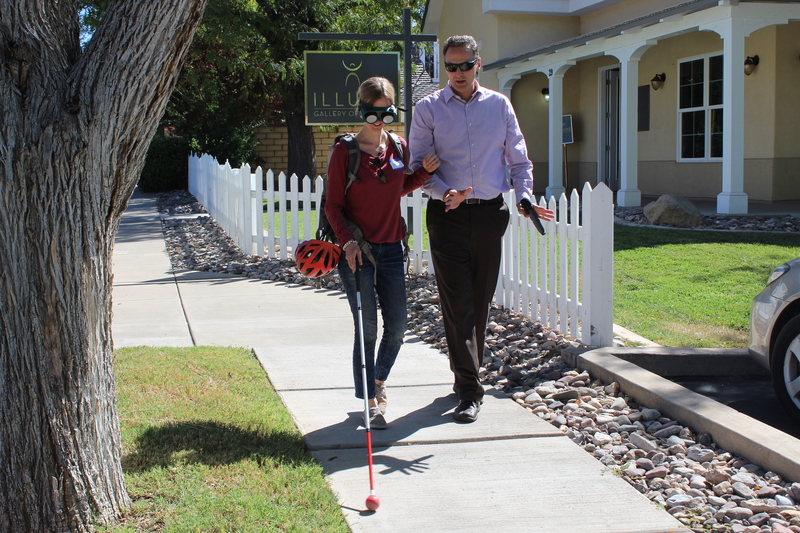 The team brought two wheelchairs and two pairs of blind simulation goggles that participants took turns wearing during the walk. “I think just getting in a wheelchair or having the goggles on really gave you a little more insight as to how people with disabilities walk the streets and get around. I think it’s very challenging,” St. George city engineer Monty Thurber said. During the walk, Danley and Kostelec pointed out areas that are potentially dangerous or difficult for those with disabilities to navigate; places with low visibility, poor lighting and steep grades. They took time to point out situations they had been discussing happening in real time. 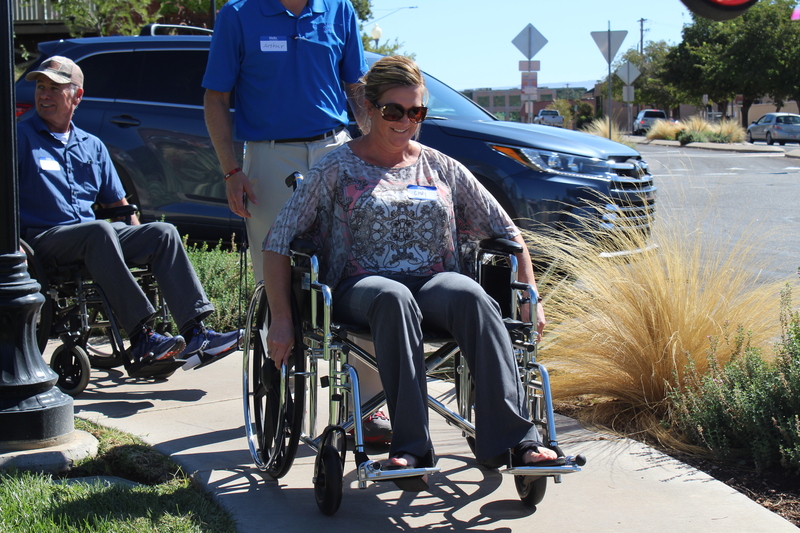 The group observed a vehicle parked on the sidewalk obstructing the path for people in a wheelchairs. Kostelec encouraged everyone to take action and report issues like that in order to be a part of the solution. Danley and Kostelec founded Vitruvian Planning in 2011 and first began offering their two-day Looking Glass Academy in 2015. They travel around the country showing planners the flaws in their pedestrian system and discussing new technologies and designs to better it. They perform trainings in Utah twice yearly, and were invited to St. George by the Southwest Utah Public Health Department, the city of St. George and the Five County Association of Governments. Kostelec said one of the biggest problems regarding pedestrian safety in Utah has to do with crosswalks. The first issue is that high visibility crosswalks are not permitted anywhere other than a school zone. Even at crosswalks on busy streets like St. George Boulevard, some of which are not even painted crosswalks, pedestrians must carefully cross the street while many drivers are unaware there is even a crosswalk there. The second issue is that Utah only requires the timed walk sign at an intersection to allow a person 4 feet per second of time, while federal regulations require at least 3 feet per second of time. Four feet per second is not always enough time for children, the elderly or those with disabilities to safely cross the street before the time is up. Another issue has to do with Utah’s historically wide streets. These streets make taking walks longer and blocks spaced farther apart, making it harder to get to a crosswalk. Thurber thinks that narrowing streets is an issue that should be looked at as a city. “I think there’s always things that we can do better at,” Thurber said. Other issues, while less dangerous, are still a challenge for people trying to navigate streets. 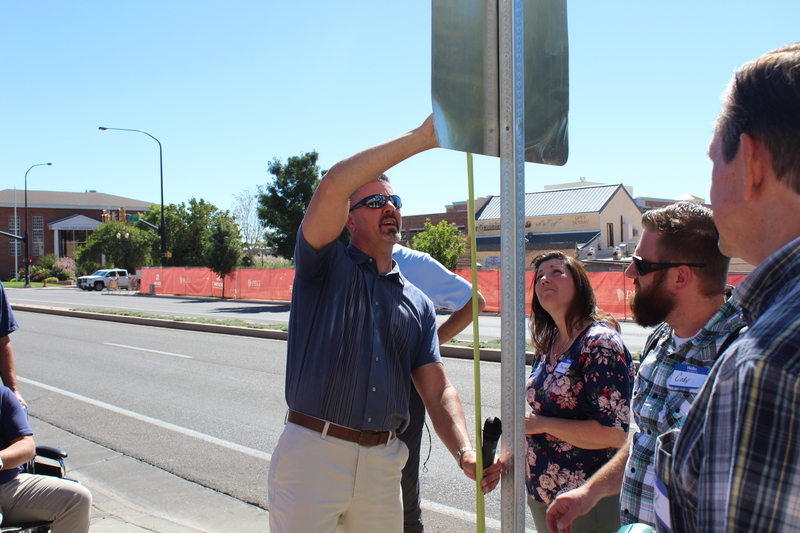 Danley pointed out a street sign in a pedestrian access area that was under 7 feet in height and demonstrated how a taller person can hit their head on it as they try to walk under. Utility boxes and fire hydrants in the middle of the sidewalk also pose a problem for wheelchair access. While Utah, and St. George specifically, do have pedestrian-related issues, they are not alone. Kostelec and Danley have come across similar issues in other states.